Thanks for your company on our EFL live text coverage today. The football never stops - follow the Premier League, Checkatrade Trophy final, Old Firm derby and WSL on BBC Sport on Sunday! 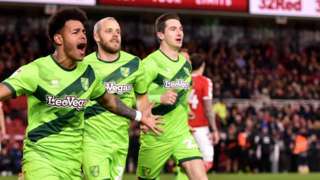 Norwich moved five points clear at the top of the Championship. They beat Middlesbrough 1-0 in the day's late game. Leeds are now second after coming from behind to beat Millwall, while Andreas Weimann's hat-trick for Bristol City was enough to defeat Sheffield United. Bolton got a crucial win at QPR but are still in the bottom three, while fellow strugglers Reading were also victorious, but Rotherham were thumped 6-1 by Derby. League One leaders Luton are 27 games unbeaten and closing in on promotion after winning at Bristol Rovers, while League Two leaders Lincoln were held at home by Macclesfield - although the Silkmen are now bottom after Notts County's win today. Enjoy this one, Norwich City fans. Your team are five points clear of Leeds United and seven ahead of Sheffield United. Middlesbrough, who have dropped out of the play-off places for the first time since the very first week of the season, face a big old game against Bristol City on Tuesday. Norwich captain Christoph Zimmermann told Sky Sports: "We've faced a very strong side. It was a tough game so we're so happy that we've won it. Seven points ahead (of third place) is a good situation at this point of the season. "We know there are seven games to go so there are plenty of points to get, but we'll take it game by game and fight like we've done all season." Goalscorer Onel Hernandez says: "I love this team. I enjoy every moment and every day. It's amazing." Norwich are five points clear at the top of the Championship. Middlesbrough, meanwhile, are a point outside the play-offs after their fourth successive defeat. Seven points clear of third place. Seven games left to play. The Premier League beckons for Norwich City. Almost! Jon Mikel Obi's shot is blocked. Back in the Norwich box... Tim Krul punches clear. Halfway through the six minutes added on and Norwich make a change. Goalscorer Onel Hernandez goes off, to be replaced by Timm Klose. Goodness me - Jordan Hugill has to score for Middlesbrough there. He has to score. But he doesn't. Boro send in a cross from the left, Hugill is unmarked six yards out, but he mistimes his jump and fluffs the chance. SIX minutes to be added on. Emi Buendia's shot is deflected wide for a Norwich corner, which comes to nothing but eats up a few more seconds. In truth, that Stewart Downing header apart, the visitors haven't looked unduly troubled since taking the lead. Boro take off defender Ryan Shotton for big striker Jordan Hugill. It was a pretty galling 3-2 defeat for Sheffield United by Bristol City at a packed Bramall Lane, but Blades boss Chris Wilder said his side weren't at their best. "I have always said there will be lots of twists and turns. It's a disappointing day for us. The way that the club ramped the game up was incredible, and we didn't reward the fans with three big points," Wilder said. "It wasn't to be, we played a really good side. We weren't at our best, especially first half. "The goals were poor from our point of view so that was disappointing. We had good chances late on to get a result, but we didn't. "Bristol City needed a result, but the biggest thing is we didn't win the game. We've always reacted strongly and we will have to do that again next week." This game is opening up now and there are plenty of spaces for Norwich to exploit. They try to be too cute in the box and a chance goes begging. Mario Vrancic, who scored a couple of goals in a big win at Leeds a few weeks ago, is brought on by Norwich boss Daniel Farke. Marco Stiepermann, who took a knock a few moments ago, makes way. Earlier, we posted a picture of Portsmouth's owner in Trafalgar Square preparing for tomorrow's Checkatrade Trophy final. They've touched it in the box for a second time now - and they've almost equalised! Boro sub Stewart Downing jumps highest and nods towards goal, but Christoph Zimmermann clears off the line. Norwich go close again through Emi Buendia, who puts his low shot wide from 12 yards. Sky Sports have just flashed up a stat that says Middlesbrough have only touched the ball once in the Norwich box since half-time. That was Daniel Ayala's header that hit the post with the score at 0-0. Onel Hernandez sends a tame shot towards the Middlesbrough goal and Darren Randolph is equal to it. As we march towards the final quarter of an hour, Hernandez's second-half strike remains the difference between the two teams. A change in midfield for Middlesbrough - Mo Besic is on for Adam Clayton. A couple of boos can be heard from the home supporters as a Middlesbrough attack fizzles out. A reminder that Boro will end tonight outside the top six if they lose.